TÁIM ANOIS ag obair mar an t-Oifigeach Náisiúnta Gaeilge le bliain agus caithimé rá go bhfuil an bhliain tar éis eitilt. I have been working as the National Irish Language Officer for a little over a year now and I thought you might be interested to know what I have been up to. I write this as béarla as I realise that those of you who I am trying to encourage to use the cúpla focal are my biggest audience whose help I need. I could go on a political rant about how the Fine Gael/Labour Government is turning a deaf ear to the needs of the Gaeltacht and Gaeilgeoirí all over the Country – ‘What’s new?’ says you. The straitéis teanga is nowhere near being implemented and Gaeilge in education is currently under review. There is the constant threat of closing down rural schools, due not to declining numbers but the fact is that the bar is constantly being raised to keep the schools open – is the Government expecting Irish-language supporters to have more babies to meet the numbers for schools? An extra 10 students by 2014 are now required to maintain the four-teacher ratio in rural schools. This will have a huge impact particularly on the Gaeltacht and language development. There are so many issues I could address but I want to keep this as a positive update. I want to let you know how we are doing as a proactive party that tries to promote and nurture our grá for our teanga agus cultúr. 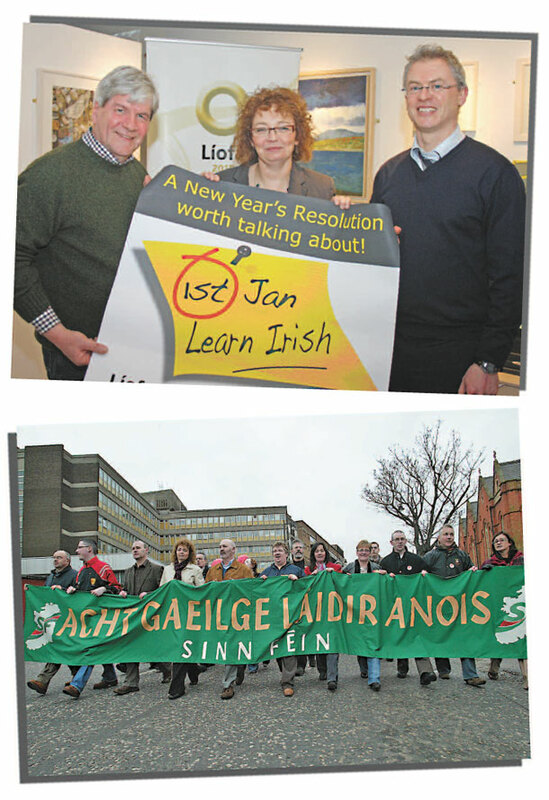 It takes time to have an impact and to have a party lán Ghaeilge but we are making some progress. There is a six-weekly electronic bulletin with updates about the main language issues. This is available to everyone by emailing me at [email protected] to be put on the mail list. 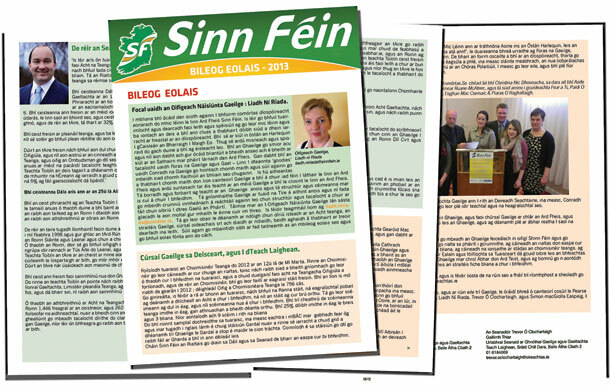 I was greatly encouraged to hear more Gaeilge being spoken during the Ard Fheis this year and we have had our various events which I have written about before. And don’t forget to check out our Gaeilge Facebook page ‘An Cabaire’. Gaeilge activists around the country are being identified and so before long you can expect to have no excuses left as there will be Irish-language classes or events in your area, hopefully rolling out in the autumn. I realise that people simply don’t have the money to spend on classes or attending Gaeilge events around the country. With this in mind, we have to go back to organising local events. It can be anything from art classes, to book clubs or quiz nights and meet-ups, the only difference being that these events could be done through Gaeilge. Take it out of the classroom situation. You just happen to be doing something you enjoy as Gaeilge. We are also implementing a new system where, if you are líofa, you can put a green symbol with the letter ‘G’ in your correspondence, a red ‘G’ for no Gaeilge at all and an orange’G’ for those of you who are learning. This is a good method for identifying the different levels of Gaeilge with those who you are in touch with. Naturally, if you see the green ‘G’, you can correspond totally as Gaeilge and so on. I hope that by this time next year that those of you who are orange Gs will have moved up to green Gs and reds of course will have moved to orange. Stay with it as clarity will come. I always say that language has no borders and I strongly believe that it can strengthen and support our vision of a united Éire. Our comrades san Sé Chontae are going from strength to strength with Líofa and are inspirational with their level of commitment and genuine passion for our language. We need to adopt their attitude and pull up our socks if we want to ensure that it’s not just lip-service in the rest of the country – so watch out as this Corcaíoch may well take out the bata mór and indeed have some on-the-spot Gaeilge tests.